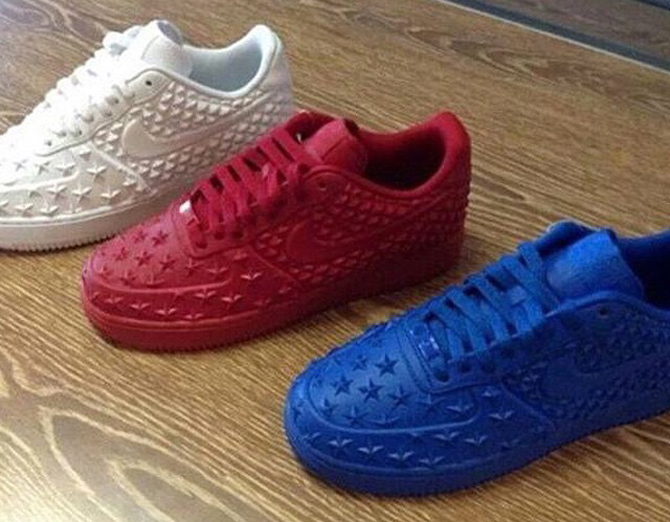 Star studded Nike Air Force 1s looking like a 4th of July pack. The Nike Air Max 90 "Independence Day" pack has a sequel of sorts coming this year. Shown here is a new trio of Nike Air Force 1s releasing in the coming months that will come in red, white, and blue, although it doesn't appear to be an official 4th of July pack. At first glance the group might seem like another Riccardo Tisci take on the iconic basketball shoe thanks to the Givenchy style stars, but that connection seems unlikely given that collab was with Tisci in the first place, and not Givenchy. Like the Air Max 90 "Independence Day" pack before it, this is a trio that features one red, one white, and one blue shoe. There is no concrete release date yet for this Nike Air Force 1 pack.